We were founded by an engineer with an insatiable curiosity about why some projects delivered results while others did not. He attempted to satisfy this curiosity by collecting data from real project leaders and team members about what was working, what was not, and what they would do differently on their next project. The combination of curiosity and end user research is the foundation of Prosci. This article explores how Prosci has built the largest body of knowledge on managing the people side of change to deliver organizational results. The image below is a visual timeline of Prosci’s research evolution. Across the horizontal you will find the ten studies Prosci has conducted: 1998, 2000, 2003, 2005, 2007, 2009, 2011, 2013, 2015 and 2017. Across the vertical you will find key topics of research over these nine studies. Dark purple mark when the new topic area was added to the research. Across the lifetime of Prosci research, we have continued to add and explore new topics while at the same time adding depth and broadening the knowledge on existing topics. This combination is what yields the ever growing, ever evolving, ever “at the cutting edge” aspect of Prosci’s research. The journey has been profound, providing change leaders with increasingly insightful direction and guidance on managing change. While there are many interesting twists and turns along the research journey, here are several seminal moments when Prosci’s research took leaps forward by advancing specific change management challenges or topics. 1998 was Prosci’s first study specifically on change management. Previous benchmarking studies had explored Business Process Reengineering and call center management. Interestingly, those studies each yielded insights on the challenges and importance of the people side of change. So, in 1998 the first change management study was conducted. One hundred and two participants from around the world shared their lessons and insights on some fairly high-level change management activities such as the greatest contributor to success, biggest obstacles, methodology, communications, sponsorship and training. While the findings were fairly high level and general, they laid the foundation for what was to come. Prosci’s third benchmarking study included a new section on change management resourcing and budgeting. This new topic area aligned with the shift change management was experiencing, from concept to practice. While use of methodology was still quite low (34%), an increasing number of projects were starting to actively dedicate people to managing the people side of change and assign actual project budget for change management activities. Since 2003, resourcing and budgeting has remained a central topic in each study, with recent studies adding insights around the source of change management resources and key factors for estimating resource needs. In 2005, Prosci began actively researching and developing how organizations moved past a project-by-project approach toward embedding change management capabilities in the organization—what we call Enterprise Change Management. A small research effort in 2004 provided the foundation of the Prosci Change Management Maturity Model. The 2005 study for the first time included a section on enterprise deployment, engaging the innovators and early adopters on the organizational capability journey. Early findings focused on the action steps and support required to infuse change management into the fabric of the organization. Since 2005, organizational capability has remained a key section of each report. More recently, data collection has shifted toward activities that move an organization up in maturity and the establishment of structural functions (like a Change Management Office or Center of Excellence). Measurement of change management has always been a challenge. Even back in 2009, Prosci’s studies began exploring how practitioners were measuring their work and their results. Prosci’s 2013 study included a significant focus on measurement and metrics, collecting data that would lead to the creation of the Prosci Change Scorecard (recently published in a leading Organization Development textbook). Data on measurement has provided practitioners with concrete direction on what to measure, how to measure, when to measure, and where to get data. Even ahead of the greater trend across the marketplace, Prosci noticed leading organizations creating permanent job roles and positions focused exclusively on change management. The 2011 study collected data, for the first time, about these change management jobs. Study respondents provided insight on the responsibilities of these job roles. Additionally, the knowledge base was built out about where in the organization these roles resided. 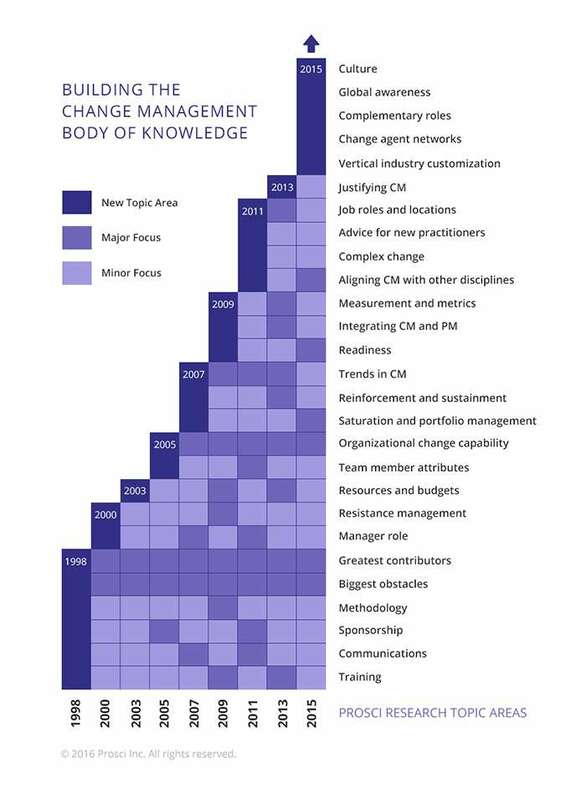 Recent studies have added to the job role knowledge base with data on the emergence of career paths in change management. While culture had always been addressed in the change readiness space, Prosci’s 2015 study explored culture in a new and innovative way. As opposed to collecting data on “how do you change your culture?” we instead focused on answering an even more compelling question, “if you better understood your culture, how could you be more effective at implementing change?” We drew upon the insights of other thought leaders to identify six cultural dimensions that had the greatest impact on how changes played out in the organization. True to form, instead of stopping at the cultural dimension location, Prosci asked respondents to identify the specific challenges and unique adaptations in times of change given their cultural backdrop. Aside from an interesting history lesson in how the research has evolved, the real value for you as a practitioner is building upon the knowledge and experiences of others. Isaac Newton once said, “If I have seen further than others, it is by standing upon the shoulder of giants.” And that is really the goal of Prosci research—to enable you to see further by building on the lessons of your peers, other giants who have aimed to deliver change results. We hope that you are able to expand and enhance your change practice by leveraging the largest body of knowledge on change management.